Ohorongo Cement today joined the rest of Albinism in Namibia to celebrate International Albinism awareness day.The event took place at the School for Visually impaired Children which also accommodates over 50 Visually impaired children with albinism. During the celebration Ohorongo Cement through its Otavi Community Trust in Collaboration with lm e.V. 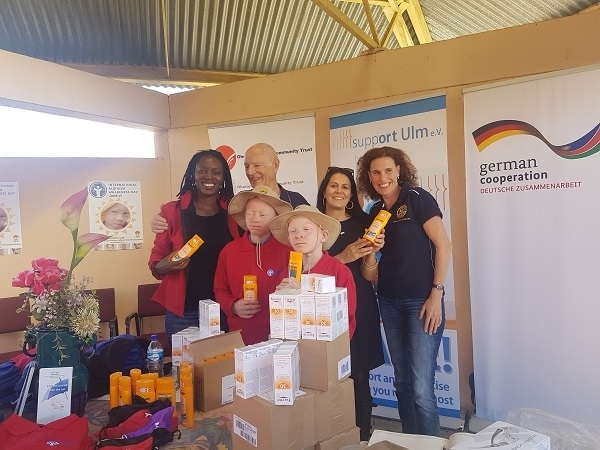 donated 300 tubes of Sunscreen lotion to the Children with albinism community in Namibia. Speaking during donation ceremony, Ohorongo Cement’s Public Relations and Corporate Communication Manager, Esther Mbathera said, Ohorongo Cement understand the challenges faced by people with albinism with regards to accessing the best sunscreen lotions needs for their skin. 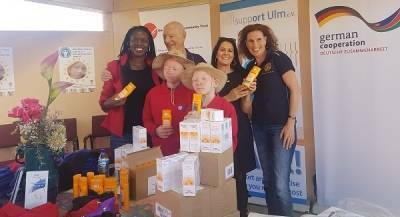 After consultation with Support in Namibia of Albinism Sufferers Requiring Assistance(SINASRA) in 2014, we were able to deliver the first consignment of special lotion tubes in february 2015. Dr. Peter Stoermer, of SINASRA), applauded OOCT for this gesture. He urge parents and caregivers to raise to the children of sending chidren with albinism to school. ““We have organizations such as OOCT, the Germany Embassy and Support Ulm e.V who are doing their best to support us with our needs. However as parent we should not alienate them but to ensure that they are integrated into society they are normal children with special condition,” said Stoermer. OOCT & Support Ulm e.V. has been supporting SINASRA and persons with albinism since 2015. Ohorongo will also donate sunscreen lotion to the two other special schools in the country that caters for children with albinism. With a population of just over 2 million, Namibia has one of the highest prevalence rates of albinism in the world, with a ratio of one albino in every 3,000 people. In November 18, 2014, the United Nations’ General Assembly adopted a resolution establishing June 13th as International Albinism Awareness Day. The International Albinism Awareness Day this year is celebrated under the theme:“Shining Our Light to the World”.